Xitang is a taste of old China, old Shanghai and old charms. Hidden away from the madness of Shanghai and its every expanding skyline, the remnants of Xitang's old town is something of a rarity. The town is both popular but photogenic, a genuine attraction for tourists and photographers that is close to Shanghai, yet worlds away. China's Grand Canal was one of the truly remarkable achievements of the ancient world. Over 1,000 miles of canal were built with some sections dating back to 400BC. To the west of Shanghai the natural waterways and lakes were harnessed to make the most of the canals, and countless town spread along the trading route. Xitang was one of those towns, and it grew to a respectable size under the Tang and Song dynasties. In recent decades the spread of modernised cities across China has threatened many traditional towns, but in old buildings, canals and bridges at the heart of Xitang still remain. In the last decade the tourism value of Xitang and a few other canal towns has been realised, and as they build ever faster freeways to connect downtown Hangzhou and Shanghai to these grand canal villages the pressure of tourism grows ever stronger. So far Xitang has held firm under the tide of travellers. Mostly these are Chinese travellers and mostly they arrive by coach for an extended day-trip. Xitang has been one of the hardest towns to reach, a virtue which has sheltered the community from the pitfalls of rapid development. There is an air of quality about the souvenir shops, there are excellent options for local cuisine by the waterways and the day-trip profile of the town has kept large hotels out of the picture. The good news is that dozens of cute little guesthouses are found all over the town, which means photographers can find a comfortable place to spend the night. Every afternoon the hordes of tourists are herded back to their coaches and they roll out of town. Every morning the local residents go about their business without the crush of sightseers. I've been to Xitang more than half a dozen times and I still love being there. As a tourist town it's very inviting and a great place to shop for Christmas presents. As a photographic subject the laneways and canals are inspiring, particularly for lucky photographers who spend the night in a guesthouse. This October I visited for the second time in as many months and found the more I learn about Xitang the more I love it. The photographic highlights for me include the steep bridges that offer raised views of the canals and their houses, the "long corridor" which runs for about a kilometre in total and provides shelter for shooting in the rain, the back lanes that run parallel to the canals with their timber facades, plus the ever present traffic of boats quietly plying up and down the waterways. Xitang is a place to wander rather than be guided. Little details like steamed beans, flower boxes and teapots by a bridge can keep you busy shooting for hours. The residents light their coal fires a little after sunrise, filling the streets with smoke and providing excellent catch-light. At 8am about a dozen boatmen finish their morning "chat and cha", then jump into their boats to work their way around to the far end of town - where all the tourists normally enter and buy ticket. 8am is also when the museums open up in Xitang. There are 10 of them. If you're not into historical artefacts as a traveller you can save half the entry ticket for the town and opt for the cheaper ticket. 100 yuan pays for entry to the old town plus all the museums, 50 yuan covers just your fee to spend a day in town. Having a charming guesthouse by the river is perfect for photographers, but breakfast may not seem so idyllic. Locals enjoy tea boiled eggs, tofu, congee and noodles. Westerners have to wait a while for the coffee shops to open, and even then most sell coffee but nothing more. There are some local flavours that are worth a try however. My personal favourites are the steamed fish dumplings, and a close second are the noodle ladies who sell wanton soup. I have a tendency to want both! On my last visit I asked the lady how to say wanton in Mandarin, to make it easy to order next time. She looked at me funny and said, "Wan-ton." Ok, I think I can remember that in future. Buses make a day trip from the Shanghai Long-Distance Bus Station (Next door to Shanghai Stadium in the south of town, get there on the Metro) every day if you want to dip your toe in the water and get a look at the town. Buy your tickets at the stadium the day before, to verify the departure time and ensure you don't miss out on a ticket. 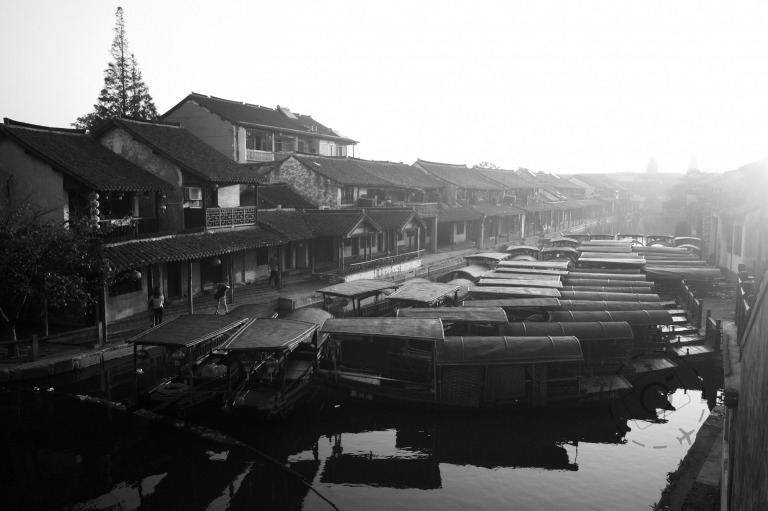 Bus tours to Xitang and other water towns depart between 8am and 9am, returning in the early evening. They make stops to flog tea and visit a few temples as well, and sometime have a guide on board who speak enough English to tell you when to be back so you won't miss the bus home. If you don't speak Mandarin then you'll need some help to enjoy an overnight visit. The best option is pre-arrange a driver and accommodation with the help of Imperial Expeditions (imperialexpeditions.com). I use these guys for custom travel arrangements in China a lot, as they have good connections with local agents and are helpful to a fault. Imperial have an existing relationship with a few guesthouses in Xitang, so you can be assured of a good view in a great location. If you do speak Mandarin then you can arrive in Xitang and have your pick of guesthouses - just avoid the holidays and weekends when the crowds are less than ideal for photographers anyway. Many coffee shops have a few spare rooms and there are dozens of places to chose from that offer a view of the canal, private toilet and a hot shower. Be warned that the local standard for towels is about the size of a handkerchief! The best accommodation in town is also brand new - Liu Yun Ge Hotel offers a range of unique rooms at a better standard than the guesthouses, it is centrally located deep in the old town but the hotel lacks views of the canal. This hotel literally opened days before my last visit, converting several shops on a back street into a proper 3 to 4 star facility. The rooms are charming with original timber, modern bathrooms to suit westerners and separate showers. TV and air conditioning are standard but not all rooms have windows overlooking the laneway below. No two rooms are the same. This will be the hot hotel in town for some time to come, at least it will once the word gets out. The official website for Xitang is found at xitang.com.cn, and it contains enough information to wet your appetite. The town is 95km from Shanghai and a mini-van takes 2 hours to reach it from HongQiao airport Shanghai. "Zhong Xin Yi" is a quaint guesthouse located on the main canal with fabulous views of the water. The owners are charming and don't speak a word of English. Phone 159 5737 9465. Imperial Expeditions are my personal favourite for anything in China and Xitang is no exception. imperialexpeditions.com or phone +86 29 8839 0682 for their head office in China, (718) 312 8486 in the USA, or (02) 8005 0499 in Australia. Oleg has an informative guide for Xitang and a few other water towns on his website - olegnovikov.com/cptg/zhejiang/xitang.shtml. I have visited the towns of Tongli and Wuzhen as well, and I like Wuzhen enough to make more than one trip but found Tongli to have been a little over-run by travellers.